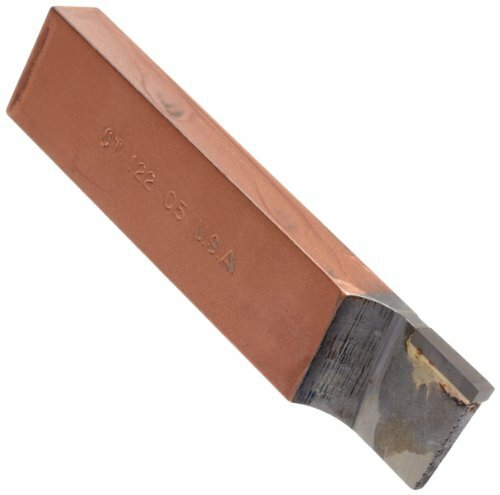 The American Carbide Tool CT-style C5 grade carbide-tipped brazed tool bit has a right-hand cutting direction for roughing or heavy machining when performing cutoff or grooving on steel and steel alloys. The CT-style, also called COR-style, tool shape has a 5-degree end cutting angle and a taper on the non-cutting side for cutoff or grooving of solid bars and tubing stock, and a right-hand cutting direction for right-to-left feed. The tool has a positive, 6-degree rake angle that provides a sharp edge for making continuous cuts. The tool has a C5 grade uncoated carbide tip, which provides good resistance to shock and wear for roughing and heavy machining of steel and steel alloys. Carbide is harder than high-speed or cobalt steel, making it more wear resistant at high speeds and providing longer tool life. The tip is brazed to a square steel shank that fits square toolholders.